Vehicle passes are required for overnight self-parking and must be displayed on the dashboard of your vehicle. Vehicle passes for overnight self-parking are available upon arrival from our valet and front desk staff. If the vehicle does not have the pass displayed, it is subject to towing. Self parking is complimentary and based upon availability. Valet parking is $21 plus tax per night per vehicle including unlimited access. Hotel Valencia offers liquor and cocktail drinks at the Hotel Restaurant, Vbar and through in-room dining. Outside alcohol is prohibited and will be collected and stored for our guests until departure. You will receive an email confirmation letter within 2 hours. Please carefully review your reservation information. The hotel offers a limited number of connecting rooms in king to double/double configuration. Requests for connecting rooms must be made in advance, are subject to availability, cannot be guaranteed and, if available, are assigned at check-in. To request a connecting or adjoining room, contact the front desk at the hotel directly prior to arrival day. The hotel will do its best to accommodate these requests, but cannot guarantee them. 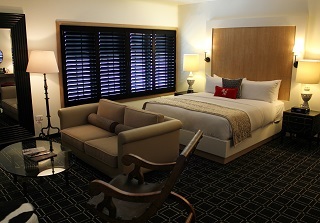 The hotel recommends choosing a specialty suite to guarantee connecting accommodations. If you have questions about booking group accommodations at a Valencia Group hotel, please call our reservations center at 855.596.3396 or e-mail reservations@valenciagroup.com. Pet Policy: Pets are not allowed. Please contact the front desk if you need assistance in boarding your pets. Experience a luxurious room featuring views of the Santana Row district, Santa Cruz Mountains or beautifully landscaped courtyard. Reminiscent of Old World Spain, our rooms feature oak-plank headboards, red velvet monogrammed and lace patterned pillows atop a clean white, plush custom Valencia bed. The marble and teak bathroom features a traditional bathtub/shower combination and custom Lather Apothecary products. Upgrade your experience and stay in a luxurious room featuring Juliet balconies with views of the Santana Row district, Santa Cruz Mountains or beautifully landscaped courtyard. Reminiscent of Old World Spain, our rooms feature oak-plank headboards, red velvet monogrammed and lace patterned pillows atop a clean white, plush custom Valencia bed. The marble and teak bathroom features a traditional bathtub/shower combination and custom Lather Apothecary products. Experience a luxurious suite featuring views of the Valencia Park or Santa Cruz Mountains. Our suites are spacious with designs reminiscent of Old World Spain. This oversized suite features a conversation area with a bathroom featuring marble and teak, a walk-in shower, separate soaking tub and custom Lather Apothecary products. 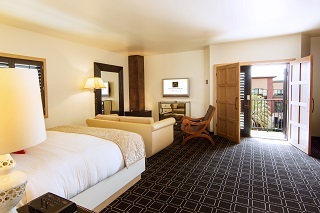 Experience a luxurious room featuring a balcony with views of the Valencia Park or Santa Cruz Mountains. Our suites are spacious with designs reminiscent of Old World Spain. These oversized rooms include a conversation area with bathrooms featuring marble and teak, walk-in shower, separate soaking tub and custom Lather Apothecary products. 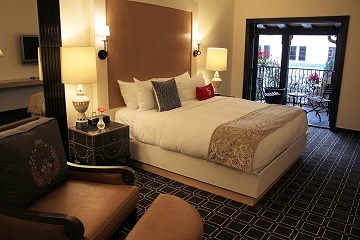 Experience a luxurious room with wheelchair access, featuring views of the Santana Row district, Santa Cruz Mountains or beautifully landscaped courtyard. Reminiscent of Old World Spain, our rooms feature oak-plank headboards, red velvet monogrammed and lace patterned pillows atop a clean white, plush custom Valencia bed. The marble and teak bathroom features a roll-in shower and custom Lather Apothecary products. Unwind in a one bedroom suite featuring a separate living room and balcony facing the Santana Row District. 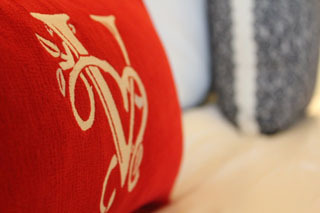 Reminiscent of Old World Spain our rooms feature reminiscent of Old World Spain oak-plank headboards, red velvet monogrammed and lace patterned pillows atop a clean white, plush custom Valencia bed. The marble and teak oversized bathroom features a walk-in shower, separate soaking tub and custom Lather Apothecary products.